As Foo Fighters wind down another leg of the massive Concrete and Gold Tour with a Wrigley Field doubleheader that rocked 75,000+ of Chicago’s Foo Fighters faithful, Dave Grohl announces an unprecedented new project born of the most challenging performance of his storied career. Play is a two part mini-documentary, directed by Grohl with help from his Sound City/Sonic Highways collaborator Mark Monroe, celebrating the rewards and challenges of dedicating ones life to playing and mastering a musical instrument. Part one opens with narrated behind the scenes footage featuring discussion of the love of playing music and the lifelong relationship with an instrument, and detailing the process and challenges of recording and filming this unique performance. The mini film then segues to the titular 23 minute, one-man-band instrumental recording on which Grohl plays all seven instruments on the track, all live. The entire song was played by Grohl, each time on a different instrument, live for 23 minutes. Beginning with the recording of the entire drum track purely from memory, with no sheet music or guide tracks, followed by guitar, then bass, then keyboards, and so on… Grohl tasked himself with a one-man-band recording session that was forced to start from the very beginning of the 23 minute song any time the slightest mistake was made or if Grohl felt he could do a better take. Concrete and Gold engineer Darrell Thorp was on hand to capture the sounds. 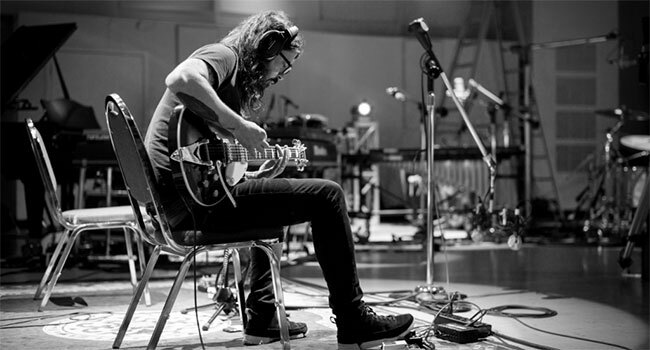 Filmed in classic black and white by Brandon Trost (The Disaster Artist, This is The End), with lighting modulating to match the dramatic peaks and valleys of this epic instrumental, Play was then edited to feature seven Grohl’s recording together. The Play online interactive experience offers viewer/listener/participants the options of taking in the mini-doc and Grohl performance as is, focusing on one instrument, and/or downloading Play sheet music. The online version of Play also includes a list of organizations where time, money and instruments can be donated to the cause, and places where musicians young and old alike can have the opportunity to play live music. Through partnerships with music and media organizations, schools and charities the world over, Play and its portrait of the joy of playing music should be a catalyst for discussion and action to benefit music education on a global level. Roswell Films’ website will detail upcoming auctions with proceeds benefiting local music education organizations.